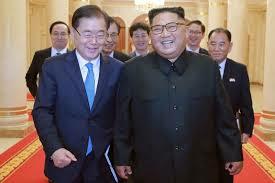 South Korea’s Moon seeks fourth summit with North Korean leader, Kim – Royal Times of Nigeria. South Korean President, Moon Jae-in has said he is willing to go anywhere to meet Kim Jong Un for a fourth summit, hailing the North Korean leader’s willingness to salvage high-stakes talks with the United States. Kim had on Friday said he was open to a third meeting with US President Donald Trump if Washington offered mutually acceptable terms after their second summit in Hanoi broke down in part over Pyongyang’s demands for immediate sanctions relief. 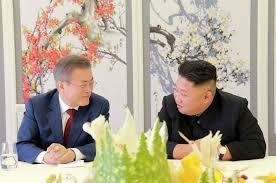 Moon, who brokered the talks between Washington and Pyongyang, welcomed Kim’s firm commitment for the denuclearisation of the Korean peninsula and called for what would be his fourth meeting with the North’s leader. The remarks come after Moon’s brief summit with President Trump at the White House last week as he tries to reignite the stalled diplomacy.